Just last night, I had the opportunity to see Neil Young perform live at Massey Hall in Toronto, Ontario in the single most amazing musical performance and most politically-charged event that I have ever been to. As an avid concert-goer this is a hard title for me to give away but Young most definitely deserved it. The show was part of the “Honor the Treaties” concert series that Neil Young is putting on with opening act Diana Krall (who was not too bad herself!) to raise money for the Athabasca Chipewyan First Nations community and their struggle against the Canadian Oil Sands and tar sands extraction. By teaming up with the Honor the Treaties foundation, Young filled Massey Hall and donated all profit to the organization’s Canadian cause. Recently Neil Young spoke out about the devastation the tar sands are wreaking on wildlife, aboriginal communities and pollution levels in Canada. In a backlash, several radio stations in the area stopped playing his music with claims that he doesn’t know what he’s talking about or that he’s ignoring the amount of jobs provided by the tar sands. With a little research, it seems to me that Young knows exactly what he’s talking about. Not only is the industry ruining the environment but fiscally it does very little for Canada. In fact 71% of its shareholders are foreign! That’s a lot of money leaving the country when you consider the degradation taking place. So where Norway has been able to gain 644 billion dollars from their petroleum industry, Alberta has only gained sixteen billion. If we’re talking pure numbers here it doesn’t really even make sense. Factor in the emotionally-charged, treaty-violating, climate-destructing aspect and the cause is completely worthwhile. 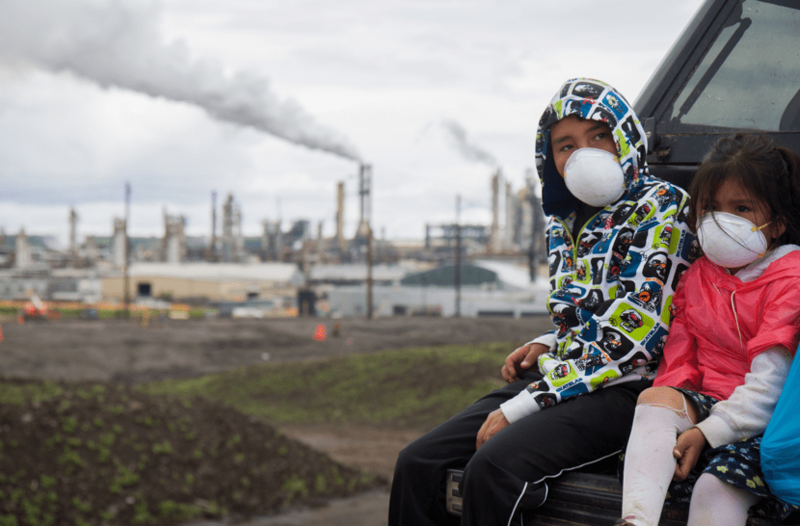 In terms of the effect on humans, indigenous communities downstream from the tar sands have experienced above average rates in deadly cancers and have lost access to much of their land. In fact, the Athabasca Chipewyan First Nations and Mikisew Cree First Nations have lost 80% during parts of the year due to the tar sands. In terms of wildlife, the development has devastated the boreal forest, only 0.15% of which is reclaimed. In twenty years it is estimated that 30 million birds will be lost and over time the caribou population will die off altogether. I’ve just given you some of the more disturbing factors that I found but you can get educated on the dangers of expansion at Oil Sand Reality Check. Back to the concert. Upon entering the hall, the streets were blocked off in an incredibly spirited Idle No More protest which in case you haven’t heard of it, is an Indigenous movement to peacefully protest violations of sovereignty and to protect land and water. You can check out more by clicking here. The streets were filled with a large circle of dancing people and rhythmic drumming. Some people came with intentions of protesting but others joined in along the way. I thought it was neat how Neil Young was able to inspire and work alongside with the indigenous community to work towards a common goal. All too often people try to fight for a cause without including the group most integral to it…but I digress. Between acts the concert series featured something I’ve never seen before. 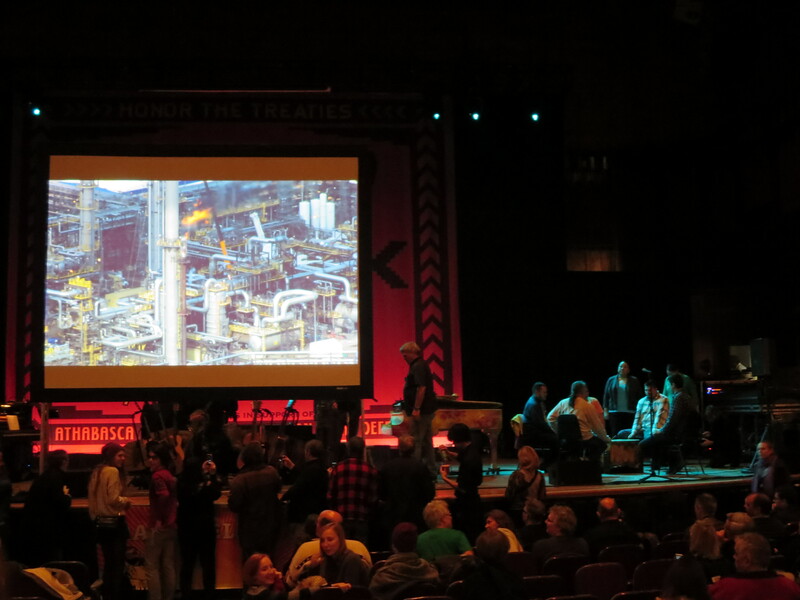 Rather than impatiently waiting for the headliner to come on stage, a large screen was erected in the center and on it a movie for Green Peace about the oil sands played, helping the audience to educate themselves. Beside the screen, an indigenous drumming circle played music. The two elements worked well together because much of the movie did not need to be heard- captions filled the audience in on what they were seeing, creating an incredibly visual experience. As an audience member it made me feel like I was part of something pretty important. Finally Young took the stage- the moment we had all waited for all night. Sitting amongst a circle of acoustic guitars, he opened his act with From Hank to Hendrix and from then on it was history in the making. He mixed his set list with lots of political songs (both new and old) with a hit-heavy second half to really excite his audience. My personal favourite of the night had to be Southern Man, written about racism in the southern United States. There was definitely something haunting about it. The music was incredible and the impact of the concert even more so. Most concert-goers left in t-shirts or carrying posters asking people to Honour the Treaties. The event drew in a respectable audience that included folk singer Gordon Lightfoot (I KNOW!) and Canadian environmentalist David Suzuki (who we met after the show–I had to say it). Not only did Honour the Treaty gain donations via the tickets but direct donations were also taken in for the Athabasca cause online and at the concert. You can donate yourself right here. For somebody who has always longed to grow up in the 1960s–an era of change and important political events, this concert is always going to stick out in my memory. The music was amazing and Young reminded me that pressing issues still exist today in Canada and require our attention. For a link to my personal blog and to see live footage of the concert please visit www.gabriellebossy.wordpress.com. ”Econony”, Oil Sands Reality Check, http://oilsandsrealitycheck.org/factcategory/economy/. “Economy”, Oil Sands Reality Check. “Land and Species.” Oil Sands Reality Check.